This text was taken from a leaflet by Isaac Cronin (Box 14221, San Francisco, Ca. 94114). Thanks to No Limits (Box 2605, Madison, WI 53701) for the information. It appeared in their June/July issue. The ‘movement’ declares itself ‘autonomous’: it doesn’t accept any ‘mediation’ and asserts that it is independent of all organized forces, even those of the ultra-left. It is not a student movement. It’s a movement of struggle uniting workers, feminists and the unemployed.” In 1977, unlike the ‘Italian May,’ no powerful leader has emerged. ‘We refuse all delegation of authority,’ insists one rebel. For seven hours Rome was in the grips of full-scale urban warfare. Two gun shops were ransacked for firearms, innumerable shops, cafes and hotels were damaged and hundreds of cars and many buses were smashed up, overturned or burnt. 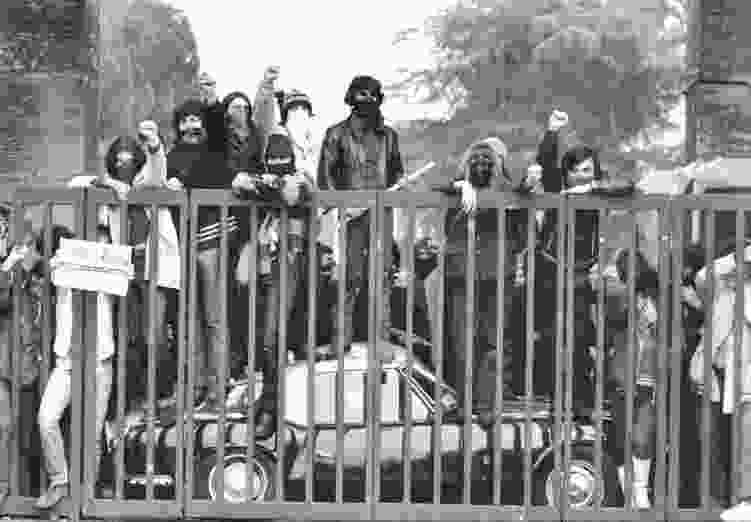 The offices and newspaper of the ruling Christian Democrat party were attacked with petrol bombs… Signor Francesco Cossiga, the Interior Minister, described their actions as a ‘pre-arranged and criminal plan of guerilla warfare,’ and the youths certainly gave that impression. They moved deliberately and without emotion, calmly doing as much damage as possible. MILANO, March 12—In the dark a policeman is halted, a gun at his head. He is disarmed of his service weapon. Let’s take this episode as a turning point in the armed struggle against the state. 1977, almost spring, let’s record the date. The recent events in Italy, which began with the armed assault on Rome, and in the next week spread to Turin, Bologna and Milan, mark a new phase in the second global assault of the proletariat. The traditional revolutionary strategy of defensive reaction to an outrage or excess committed by the state has been set aside for an offensive stance in which the actions, goals and consciousness of the movement itself are taken as the central reference point of struggle. This movement naturally rejects the notion that revolt must justify itself or that a dialogue with power is possible. Lotta Continua arrived at Piazza Esedra in disarray, without an organized plan. The dissolution of the movement took place Monday during a meeting at a student assembly hall, where critiques and auto-critiques were presented in an atmosphere of mounting confusion, without their arriving at any clear polarization of positions, without their being able to clearly decide who were the good students and who were the bad. 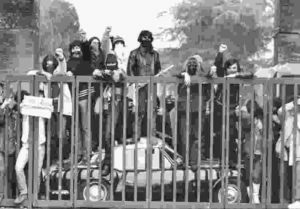 The resurfacing of an authentic revolutionary movement in Italy has compelled all other political forces to define themselves in relationship to the revolutionary offensive. While the most extreme of Lotta Continua’s militants (Lotta Continua is a large extra-parliamentary grouping with one foot in traditional leninism and the other in self-management) find themselves in the untenable position of having to confront a movement which explicitly refuses the organizational perspective of the ultra-left, their right wing takes up the reactionary chorus “the autonomists are provocateurs.” The C.P. seeing capitalism, which is the basis of its power, seriously put into question, runs terrified into the arms of the Christian Democrats, leaving behind it a vacuum which the extra-parliamentary left, in a state of disarray, is incapable of filling. Hasn’t the C.P. with this choice [defining the masses as fascist terrorists] compromised itself a little too much with power, to the point of leaving unprotected its own left-wing to the point of no longer controlling the ever increasing terrain of protest? The Italian bourgeoisie finds itself in a position of complete weakness and dependence. Unable to launch a violent offensive against the masses out of fear of antagonizing the entire working class of Italy, and yet unable to count on the recuperators of the left to soften the violent thrust of the movement, the state’s only hope is that the crisis will dissipate without the workers, who have been in almost constant revolt against capital since 1969, launching an attack of their own. As in 1968 in France, it is the nature and extent of the revolt of the proletariat which will decide the outcome of the current struggle. The spectacle, for its part, seeks to minimize the participation of the proletarian masses by presenting the origins, goals and methods of the movement as irreconcilable with those of the workers. Revolutionaries are complicit in maintaining the workers estrangement from radical currents as long as they do not directly attack this manipulation and as long as they present their own aspirations as realizable separate from a revolutionary workers’ movement. Hour after hour, misery for those who work. Take the attack to the heart of the state, all power to the dispossessed youth. We are provocateurs, you are terrified stalinists and union bureaucrats, you invoke the state. Pipes for the senior citizens, puppies for the kids, overthrow the autonomous groups; More work, less pay. When the wind blows, one must try to live. Workers’ gastronomy, eat the bosses. Despite its limited numbers, this group [the Indians] is fast becoming one of the forces in the movement. They have demonstrated the subversive power of laughter and of derision…They express a ‘desire to change life and at the same time a certain despair.